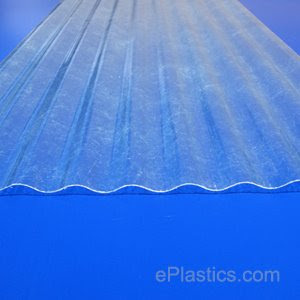 Fiberglass Sheet for Roofing - Patio, Greenhouse, Car Port or ? It is Summertime and there are a lot of homeowners looking into re-roofing the house, putting on or replacing a patio roof, or maybe building a greenhouse, flat or corrugated fiberglass sheet roofing materials might be the answer to what you are looking for to meet your needs. Fiberglass sheet roofing offers flexibility and is usually bought in sheets or panels made of synthetically produced fine glass fibers. Panels are weather-glazed, providing a waterproof seal and a tough, durable roof structure. Fiberglass sheet is very resistant to corrosion and chemicals, is shatterproof, and will not rust, rot, or mildew. It requires a low level of maintenance, is much cheaper than other types of roof paneling, and can have a life expectancy of about 20+ years. The better grades have 20 year warranties. And fiberglass sheeting is very easy to install due to its light weight. Typical sheet sizes are 26" wide (to allow for a 24" overlap) and 96" or 144" long. If you have enough need, you can get the manufacturer to run a special length for you. 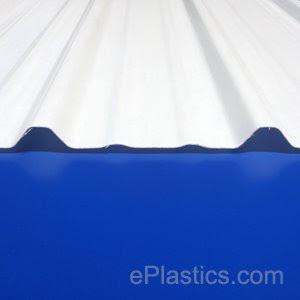 Fiberglass sheets for roofing are available in a clear or white color. With orders of over 8000 sf, any color can be run to match a specification. Special NAILS and aluminum trim are available for building a greenhouse to seal the top and sides. Even wood strips are available for securing the corrugated sheets to the cross beams and end-walls. Corrugated fiberglass roofing can be purchased in a heavy duty form that withstands high winds, heavy snow, and extreme outdoor temperatures. With interlocking between sheets, this type provides good water run-off. Industrial and Metal Buildings use a special wide 1/16" thick panel for their skylights called an "R-Panel" that are 37" x 144" or larger. These come in a translucent white - and a great alternativ e for homeowners and condo associations looking for a really high strength carport or patio roof replacement! A good amount of light will come in without the heat gain of a clear or thinner white sheet. The designs and possibilities of use for fiberglass sheeting for roofing are improving constantly. Another very interesting application is the use of the flat fiberglass sheet for solar panel covers such as for hot water solar tanks and systems. Thanks to www.ePlastics.com for the pictures. I have a PVC hoophouse but the poly film keeps shredding due to exposure. Could I skin it with corrogated sheeting?